THWOMP! II(South Broadway Athletic Club, October 6) Now the two wrestlers appear to be dancing, caught in an arm-lock, or something. The spinning makes it hard to tell. But just when you think you’ve got it figured out, a new move is introduced: The arm-lock is disentangled and a limp body is thrown against the ropes, and as it springs back, the momentum is redirected into one of the posts – BOOM! The crippled body pops back, deflates, oozes to its knees like melting ice cream, and the crowd’s roar reaches a peak: Everyone felt that one. The expression on the wrestler’s face speaks of delirium, of shattered dreams. Of brain beaten to jelly. 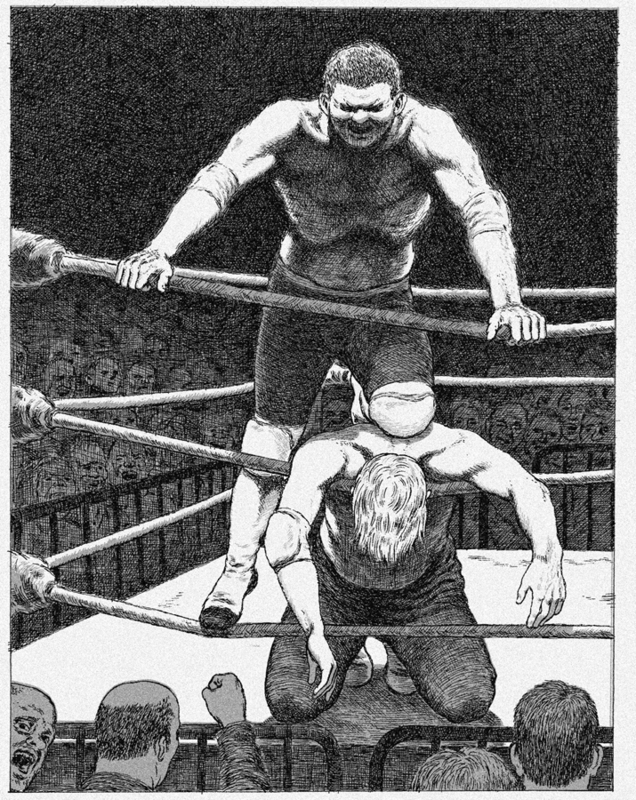 Now the vanquished is wrapped between the bottom ropes with his oppressor kneeling on his back, preening triumphantly. The crowd showers the loser with hoots and catcalls. Nothing is as resounding as a wrestler’s defeat; you can practically feel it in the rattle of your own ribcage.